Much has been written on identifying and collecting Pez since the first book by David Welch (Pictorial Guide to Plastic Candy Dispensers Featuring Pez) appeared in the early 1990’s. Most authors advise that correctly determining the age of a Pez dispenser is somewhat frustrating if not difficult. Although each Pez candy dispenser is marked with a patent date, which roughly indicates the time period in which it had been manufactured, this information alone can be misleading in trying to determine its age. 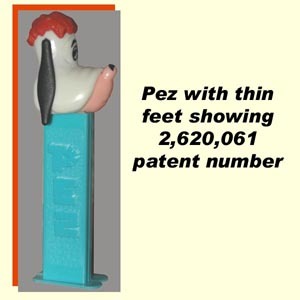 For example, the first patent number issued for the Pez dispenser was 2,620,061 in 1952. The second patent issued was number 3,410,455 in 1968. Thus, is would be logical to assume that all dispensers marked with the 2.6 patent number were manufactured sometime between 1952 and 1968. This, unfortunately, is not entirely true. Starting approximately in 1987 the footless Pez candy dispenser stems were gradually phased out of production and replaced with Pez dispensers that had feet. Yet footed Pez dispensers with 2.6 as well as the 3.4 patent numbers can be found. This means that dispenser stems were sometimes made using old molds showing patent numbers out of chronological order to their actual time of production. Knowing the approximate time line when a Pez dispenser was produced can help enormously in estimating the age of certain dispensers. 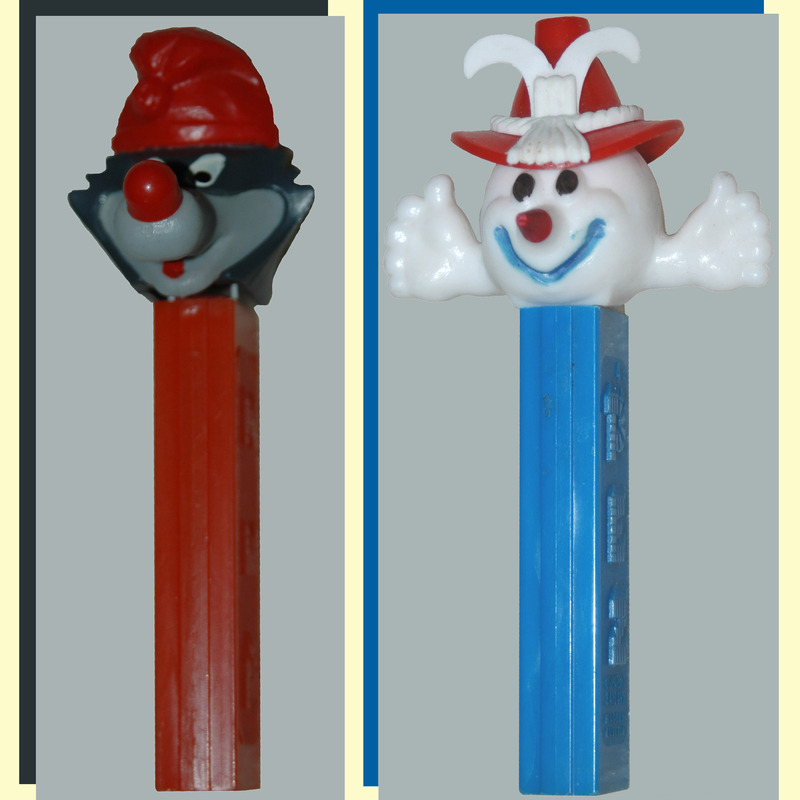 Some Pez character heads were produced only in very limited and short time frames. Welch in his second book (Collecting Pez) lists the approximate production times for Pez dispensers made up to 2002. 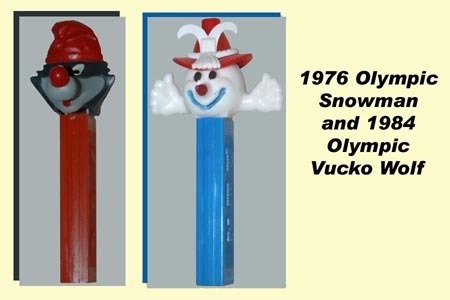 For certain dispensers, such as the Olympic Pez (made in 1972, 1976, and 1984) and the rubber headed Eerie Spectres monster Pez (1979), the actual dates of production for each are restricted to fairly narrow time frames. Many other Pez dispensers were produced over long periods of time, such as Santa C which was made from approximately 1970 to about 1987 with a footless stem. Determining the true vintage of such a dispenser is very difficult. But, hints to age in some cases can be obtained by examining closely the details of the stem and overall dispenser construction. The design of the candy pusher button, the type of head spring used, even the country of origin, marked on most dispenser stems, can provide additional insight to age. However, just as in the case of patent numbers, these clues are not 100% foolproof. Pez candy dispensers are manufactured as separate parts (head, stem, spring mechanism, etc.) and then assembled. 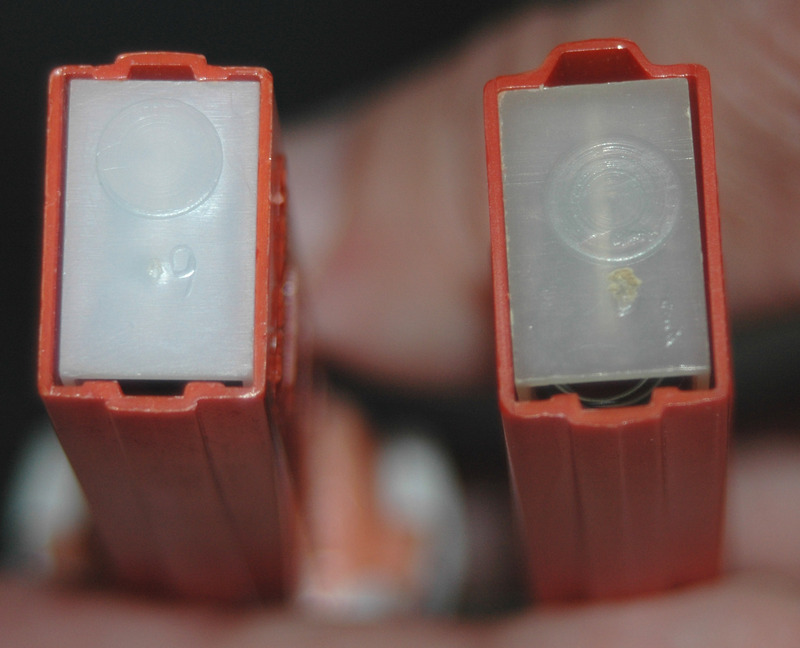 Whatever molds used for the stems that were available at the time of assembly, including miscellaneous parts that may have been made much earlier, can often disguise the Pez dispenser’s actual age of production. Even the apparently faithful “feet or no feet Pez” stem attribute can not easily assist the collector in determining the age of the dispenser. Before 1992, all footless pez could be assumed to have been produced prior to 1987. However, since footless pez have been re-introduced into the current Pez line (regular remakes, psychedelic eye remake, psychedelic flower remake, Valentine hearts, etc.) the novice collector can have difficulty identifying a truly old footless dispenser. Here, again, examining the details of the dispenser stem is helpful. The original footless Pez dispenser stems have a very shallow low profile spine (projection that runs the length of the stem) on both the front and back of the stem. 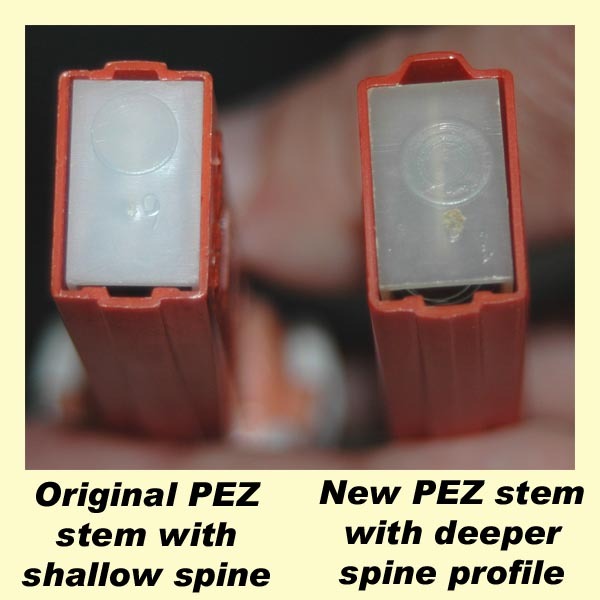 In contrast, the new re-made footless Pez stems have a much higher or raised spine profile. This is easy to see when comparing a true vintage footless pez to the new remakes by holding both dispensers side by side and looking flush at the bottom of the stems. Also, in most cases, a newer footed pez dispenser which has had its “feet” shaved off can be recognized easily in this way. A word of caution, though, is necessary since there have been identified some legitimate footless Pez stems (Santa C, Snowman B, Witch C, and Pluto with movable ears on 3.9 patent stems) that have a raised spine. It is safe to say that if you encounter a footless Pez on a stem with a 4.9 or higher patent number it is undoubtedly not a vintage Pez dispenser. In summary, examining the details of a Pez dispenser and its construction, knowing the timeline of Pez character production, and knowing the approximate production dates for stems including the country of origin can all be helpful in identifying a vintage Pez dispenser and estimating its age. However, with a few exceptions, most Pez dispensers cannot be identified exactly as to their year of production.